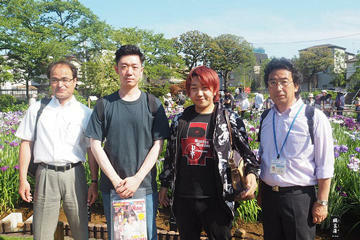 On Sunday, June 3, 2018, two international students at TUS responded to the longstanding invitation extended by the Katsushika City Tourism Department to international students at TUS, which has a campus located within Katsushika City, to take part in local festivals and activities in order to deepen their understanding of the city and its culture and, thereby, communicate the appeal of Katsushika to those overseas. 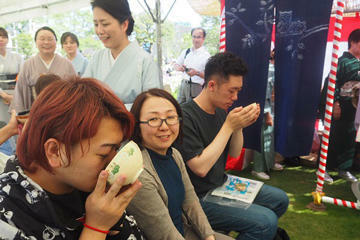 The students responded to this invitation by taking part in the Katsushika Iris Festival. 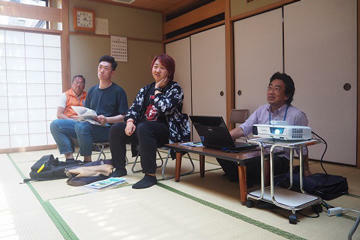 First, staff members from the Katsushika City Tourism Department talked to the students about the history of Katsushika City and it's connection with irises. The students were keenly interested, asking questions and seeking to learn as much as possible. 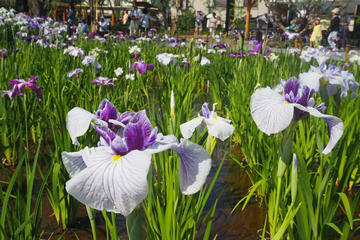 Afterwards, they moved to the Horikiri Iris Park, which serves as the venue for the Katsushika Iris Festival, to participate in the opening ceremony. Following this, they received a tour of the park. An open-air tea ceremony was conducted amidst a colorful sea of iris flowers, and the students who participated were struck by the graceful beauty of their host's manner and movements. This event was a valuable, first-hand opportunity for the students to experience the history of Katsushika City and its connection with irises, as well as to experience Japanese culture. It was evident that the students were clearly taken with it all. Photos from the event and a discussion with the students about their experience are scheduled to appear on the Katsushika City website.